This apartment is modern and clean, and the bed comfy. It's only failing is a quirky on demand hot water system that takes a long time for hot water to arrive in the bathroom, and then it only lasts a short time. 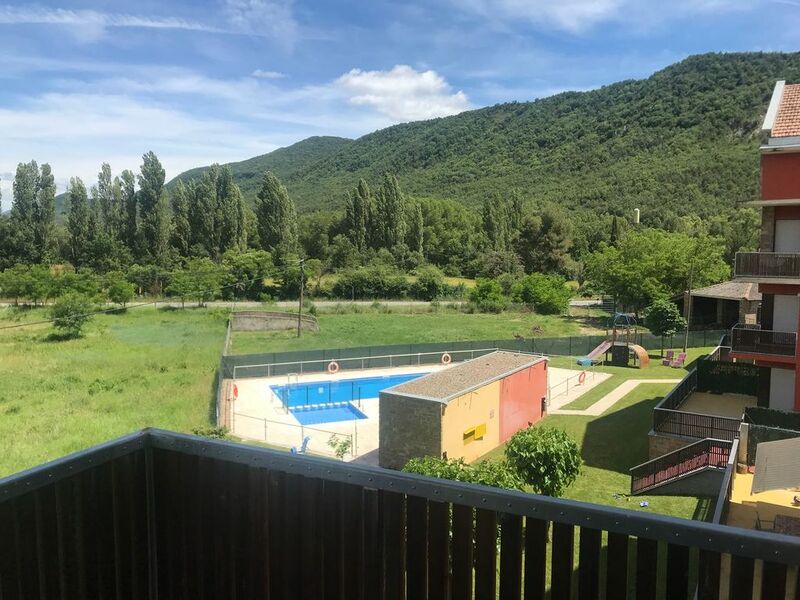 The location is great for visiting the western valleys of the Pyrenees, and is only about 15 minutes from the larger town of Jaca with museums, shopping, etc. Be aware that the unit includes no housekeeping items such as toilet paper, paper towels, soap for the bathroom, detergent for the washing machine,etc. You will need to buy or bring these with you. Although owner is not nearby, communication was good and he checked in to see that alll was going well. A ti también me gustaría agradecerte el que hayas dejado el apartamento impecable. Y tu amabilidad! Muchas gracias!! el apartamento estupendo y muy limpio ,la propietaria Nuria muy atenta y simpática. El pueblo muy pequeño , tranquilo , la casa muy bien equipada pero algo sucia , supongo que la persona encargada estaría de vacaciones . El propietario muy dispuesto en todo momento . Es perfecta para visitar la zona. Las niñas se lo pasaron genial en la piscina. Un apartamento cómodo, limpio y tranquilo. Hemos estado muy agusto. (Text automatically translated) From Pamplona / Barcelona on the motorway in the Pyrenees. (Text automatically translated) The pass-door is ? 3 cheaper buying it on the counter!